In the summer of 1984, my mother took me to see Conan The Destroyer after much begging and pleading. Being the sensitive and timid child that I was, I opted for The Karate Kid instead. I just knew there would be something in Conan that would haunt my dreams. Since I didn't care to experience a series of sleepless nights, I convinced my mom to exchange the tickets. I had no way of knowing how much that small decision would impact my movie going life. I was treated to a small story with a hugely sympathetic protagonist. Teeager Daniel Larusso (Ralph Macchio) moves from New Jersey to Southern California after his mom finds a job there. When a local bully targets him, he learns Karate from a maintenance man named Mr. Miyagi. Miyagi gives him a little more than he bargained for, instructing him in the philosophical and physical aspects of the martial arts. What captured my imagination most was the use of the Crane technique. I went home and sloppily practiced it. The next year, when the film premiered on HBO, I recorded it and watched it countless times. It was my new favorite movie. I learned its lessons well, and came to think of Mr. Miyagi in much the same way I thought of Yoda. When I heard that a remake was on the way, I was elated to see an African American in the lead role. I was also sure that the film would be superior from a technical standpoint. I was less sure as to the impact it would have. It certainly wouldn't affect me in the same way the original had. Would the new film become a mainstay for my son's generation as the original had for mine? Would it exude it's own charm, or would it simply ride on the coat tales of a recognizable brand name? 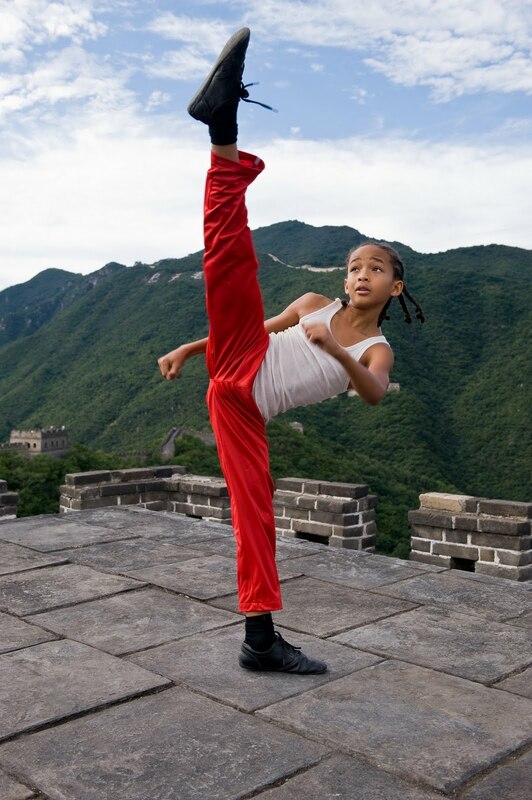 This new version of The Karate Kid stars Jaden Smith as Dre, a young boy from Detroit who relocates to China with his mother (Taraji P. Henson) after the death of his father. Upon arriving in this new land, Dre attracts the attention of a young girl. A group of local bullies take exception to this and being to administer brutal beatings to Dre. During one particularly nasty run in, Dre is saved by the reclusive maintenance man Han (Jackie Chan). Having witnessed Han's proficiency in Kung Fu first hand, Dre begs to be his student. Han initially refuses, but reconsiders after witnessing the extreme methods of the sensai who trains Dre's antagonists at the local martial arts school. Han brokers a deal that requires Dre to fight in an upcoming tournament. While he is in training, the bullies are forbidden to touch him. As Han instructs Dre, he imparts invaluable life wisdom and philosophy on him. This forms the basis of strong friendship between the two that will serve them long after the tournament is over. 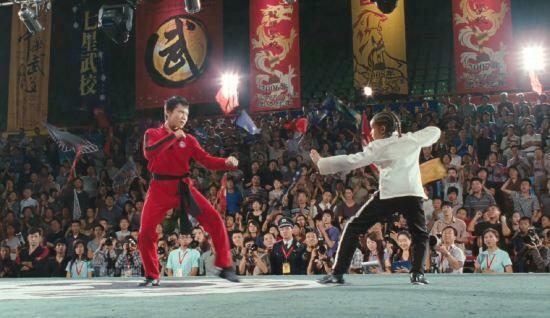 The Karate Kid contains many of the same plot developments and dramatic beats as the original. Certain moments will be instantly recognizable to fans even though they have been slightly tweaked. The two ways in which the remake differs from the original are the locale and the age of the main character. The latter makes the Dre's situation a bit harder to relate to. A beating at the hands of hormonally crazed teenagers is much frightening than a playground scrap between prepubescents. The possibility of serious injury and death is more immediate. It's also easier to suspend disbelief in terms of the fantastic physical feats and acrobatics on display. Nonetheless, the fight scenes in the remake far surpass those in the original. They are more elaborate and brutal, involving characters who strike each other with every intention of inflicting serious injury. They are easily more competent than those found in any number of more "serious" action films and they serve the necessary purpose of ratcheting up the tension a bit. Alas, the situation never seems as dire as it could have because the conflict between Dre the bullies seems a lot less personal than the one between Daniel and Johnny. Also, the advanced age of Daniel and Johnny gave the impression that all bets were off. There was no limit to how far it could go. In little Dre's case, we know that things wont get too far out of hand despite the brutality on display. As Mr Miyagi, Pat Morita exuded warmth. He was not just a taskmaster, but a friend. A Mr. Han, Jackie Chan is emotionally distant. He betrays no sentimentality or warmth. He is much more of disciplinarian then Mr. Miyagi. Pat Morita's presence had a calming affect. Though Jackie Chan is clearly his physical superior, there is still something less self assured about Mr. Han. This is not really a flaw, just a different approach to the "mentor" character. Mr. Miyagi was not unaffected by tragedy, but he seemed to continue on in relatively high spirits. Mr. Han is clearly damaged, having been beaten down by life. Jaden Smith is just fine as Dre, though most of his screen presence seems borrowed from his father. There are many moments in the film where his vocal inflections, mannerisms and line readings are reminiscent of the elder smith. This is a positive as the Will Smith persona has always seemed tailor made for summer blockbusters. Jaden is at ease with the camera. If he develops his own screen persona as time goes on, he may just enjoy the same level of success as his father. The friendship that develops between Dre and Han is less emotionally affecting than that of Daniel and Mr. Miyagi. Still, it generates an ample amount of substance. Particularly notable is the scene where Han reveals to Daniel the source of his pain. The scene is as manipulative as it could possibly be, yet it achieves the desired affect. We have come to care about Mr. Han despite how distant he seems. We want to see Dre help him to heal. The remake is also more of a traditional "martial arts" movie than the original, featuring a trek to the mountains as well as mystical moments that introduce slight elements of martial arts folklore and fantasy. The film integrates these elements seamlessly. They feel organic as opposed to contrived or intrusive. They also don't seem cliched as they should. They give the film an air of magic, helping it to establish it's own entity, seperate from the original. The Tournament that takes place at the climax is a mixed bag in terms of quality. As a whole it works, but certain elements make it seem more akin to myth and fantasy. Opponents are sent flying out of the ring with tremendous force. Surely, anyone who was sent sailing over the ropes by a kick or punch would hardly be in any condition to continue fighting. The inclusion of a scoreboard shows the influence of fighting based video games, and the appearance of one character in particular seems inspired by anime. This new Karate Kid is aware of the pop culture landscape in a way the original was not. As a result, the original, as melodramatic as it was, seems more "real" while the remake is more of an action film at heart.. The film is hampered by an excessive running time that seems padded with filler. Dre's relationship to his mom holds less weight than it should, and the fact that Dre has been uprooted from everything he knows and planted in a foreign land is never examined in a substantial way. Like his mother, the movie seems to expect him to just roll with the punches. The original was a superb example of simple, streamlined storytelling. The remake feels bloated, and the bloat holds it back from being truly great. The Karate Kid is satisfying. Though it isn't quite in the same class as the original, it provides solid entertainment in a summer season that seem devoid of that. Kids will cheer, and adults will be happy that another milestone from their childhood has not been tarnished. This remake allows kids to be participants in the action as opposed to just spectators. Flaws aside, if I had seen this as a kid it would have blown me away. That's how I know that it's done its job. 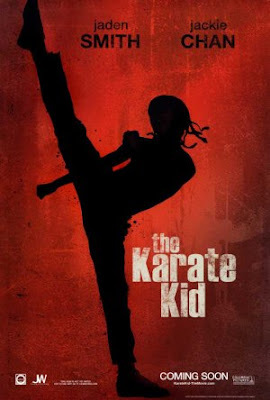 Perhaps this will become a tradition, with a new Karate Kid remake every quarter century. The story is just that timeless and durable, and this new version has energy to spare. Karate in Connecticut is the most best karate training school for kids.Because they are getting friendly environment here and one to one communication with trainers.